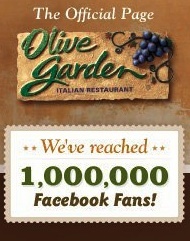 ‘Like’ Olive Garden on Facebook, then click on the ‘1,000,000 Fans’ tab to enter their giveaway. Every day, 250 entrants will win a $10 Olive Garden gift card and a voucher that can be redeemed for a FREE Olive Garden salad dressing. You can enter daily through February 3rd.